The San Diego-based aircraft carrier USS Carl Vinson will make a historic port call in Vietnam, the first time a ship of its size has visited that country since the end of the Vietnam War. 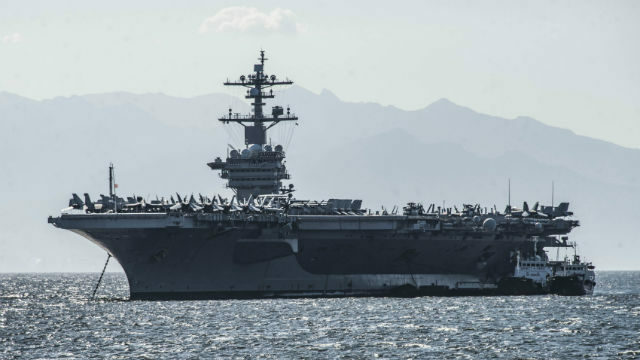 The carrier is scheduled to arrive Monday morning and anchor about two miles from the port city of Danang, which was a major U.S. base during the war. Destroyers have visited the port in the past, but the arrival of the Vinson demonstrates the growing military ties between the former enemies. Rear Adm. John V. Fuller, the commander of the Carl Vinson strike group, told The New York Times: “It’s a pretty big and historic step, since a carrier has not been here for 40 years.” Fuller’s father served in Vietnam. The Vinson’s visit also sends a message to China as that country continues to develop reefs in the disputed South China Sea and claim control over the vast area. The nuclear-powered Vinson carries 5,500 crew and up to 90 aircraft. It was the carrier from which terrorist Osama bin Laden was buried at sea.